This is the last in a 5-post series on the Top 5 Financially Fab Essentials, which cover the basic steps for becoming financially savvy. If you complete the action items in these 5 posts, you’ll be on your way to the Financially Fab lifestyle. The KISS principle states that a design or system should be as simple as possible and avoid unnecessary complexity. Using the Financially Fab System results in spending LESS time on your finances by automating recurring tasks, such as writing checks, transferring money between accounts, going to the bank for cash . . . . With the Financially Fab system, you can spend less than 1 hour per month on recurring tasks. How I use the KISS system? Wasting time at the bank: A bank trip usually takes at least 20-30 minutes of my life I can’t get back. That’s before including the commuting time. Instead of making frequent trips to the bank, I go to the ATM once a month and complete most other banking activities online or via phone. Writing checks each month: There are at least 6 monthly bills I could write a check for. Actually handwriting them would take 72 checks a year and 1 hour wasted each month. That’s an hour I could spend working out, hanging with friends, having margaritas — basically, doing anything more interesting. So instead of writing 6 checks a month, I write none of them. One bill is automatically paid on my credit card. The other 5 are paid via automated bill payments from my checking account. The picture below shows how I use online transactions to avoid writing checks and minimize time spent on recurring financial tasks. Each of the arrows represents online transactions. I transfer money automatically into each of my 3 savings accounts each month. Thus, I have no worries about forgetting to move it or accidentally spending it. Let the bank worry about finding an envelope, writing the address, mailing it out, etc. Add the recipient to your only bill pay list. Just enter the payment amount each month, simple and fast. Now it’s your turn! How can you save time and effort in managing your finances? Add your ideas to the comments section. Try using the Financially Fab KISS System. Let me know how much time it saves you! These are great tips! I am currently working on KISS. 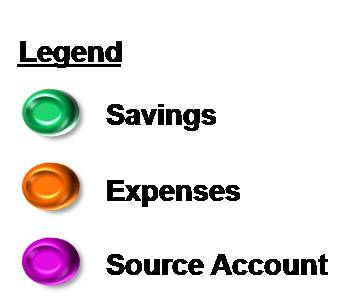 It seems so simple but I often feel as if I am stretched so thin that I must keep an eye on all outgoing expenses at all times; so letting go to automatic bill pay is no easy task but it will force me to balance my expenditures better and more importantly RELIEVE STRESS. Signed up for automatic bill pay with my rent check today. I will definitely have to force myself NOT to check my account everyday until the 8th…but hey the first step is usually the hardest one! Try out the following tips and let me know how it goes! I’m also here if you have more questions. • If I get paid on the 15th, I set the bill payment to initiate on the 17th. I also create a calendar reminder in Outlook or Gmail on the 16th that says “Confirm that checking account has enough cash for bill payments on 17th.” If my balance is low, I can change the date or cancel the payment. o I always keep the cushion between 1 and 2 days so I pay my bills before spending the cash on anything else. 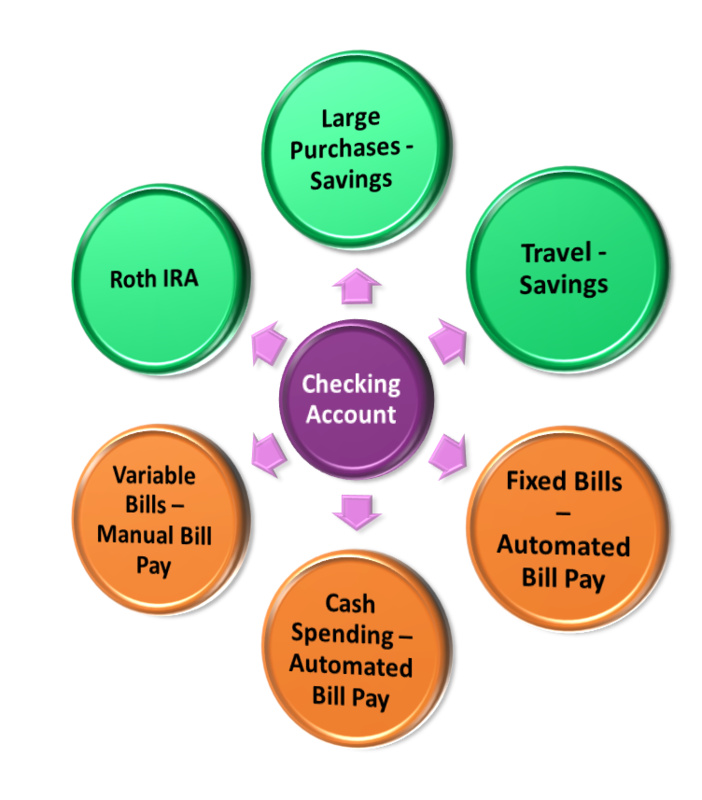 o Another tip is to open an online checking account just for automatic bill pays. That way you don’t have to worry about accidentally using the money for anything else. I pay my bills from my online HSBC checking account. I withdraw cash from my Bank of America checking account.